Last night we got to take a look at the new game mode, Prison of Elders, which will be part of the up coming Destiny expansion House of Wolves releasing on the 19th May. Now the dust has had a chance to settle on the initial hype, I thought I’d give a round up of what we know, and some of my thoughts on the Prison of Elders. Firstly, what do we know about the game mode. Prison of Elders offers Guardians a three player cooperative arena where you will face Exclusive bosses, new gameplay modifiers and rotating challenges to keep you on your toes. You will also gain access to exclusive weapons, armour and gear awards for competing. This game mode essentially replaces a raid for this expansion. •Level 28 will has NO weekly lockout, meaning you can play it over and over for rewards, but 32, 34, and 35 will. •Level 35 will be the same each week, but each week, 32 and 34 will change. There are 5 possible “curated” versions for 32 and 34. 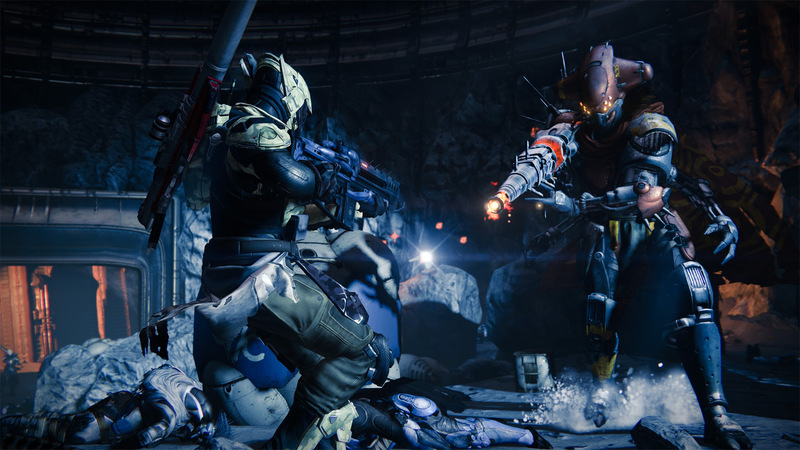 •Prison of Elders consists of 4 Rounds, each Round having 3 Waves of enemies to eliminate. On the 4th round a Strike-style boss will appear. •Starting on Round 2, Critical Objectives can appear after Wave 1 or Wave 2. Examples seen in the stream included timed mine defusing and VIP kill. There is also another objective of destroying a certain number mines. •After Wave 2, you get The Gift, which could either be a Scorch Cannon or a Heavy Ammo chest. There could be others, but those two were the only one that were shown. •Scorch Cannon: This fires sticky warheads and can be charged up to increase the devastation it unleashes. It has limited ammo, so be careful how you use it. •Vestian Dynasty: New Weapon Class. 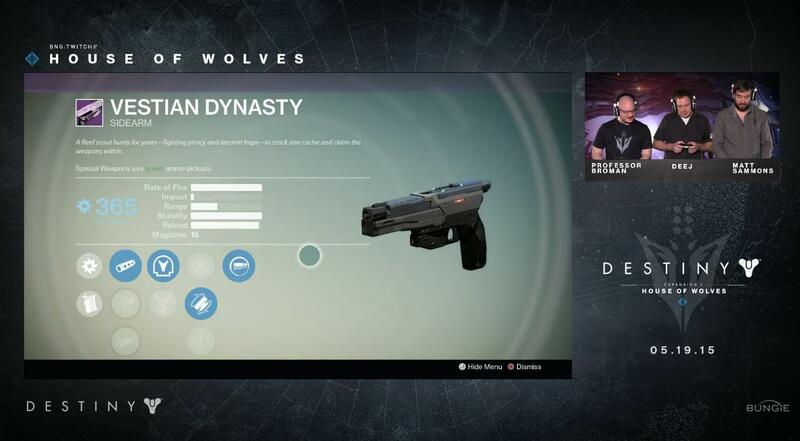 Vestian Dynasty is a Legendary Sidearm that is basically a repeating pistol. It looks pretty sweet, and I think it has a bit of a Mass Effect vibe about it. We also got to see some new gameplay modifiers. Grounded, Specialist and Airborne were not shown during the stream. Although if I had to hazard a guess, grounded probably decreases your jump, whilst Airborne might increase it. Specialist is likely to increase special weapon damage. We also got to take a lot at the different difficulties on offer. 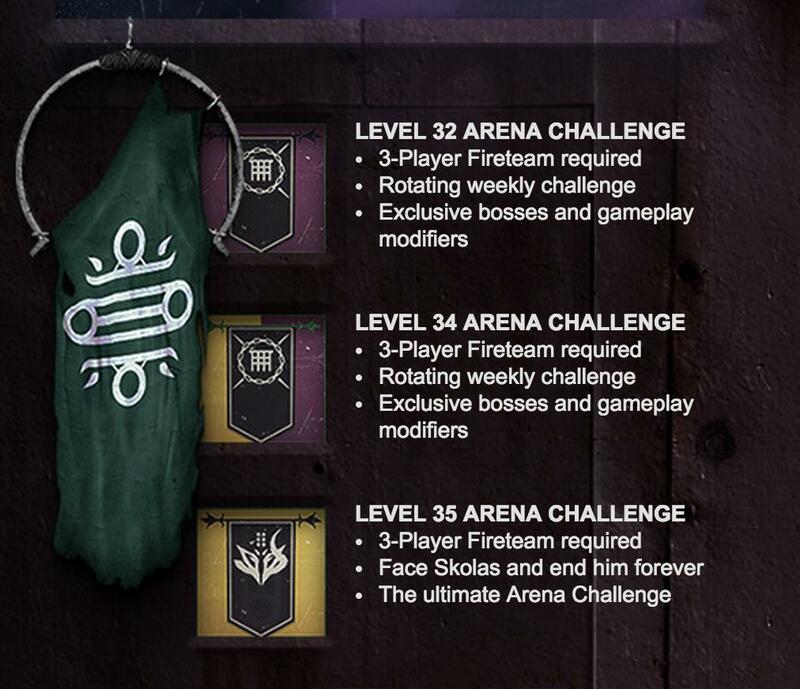 Levels 32 & 34 will feature random exclusive bosses with rotating weekly challenges. Level 35 will always feature Skolas as the final boss. • Level 32 grants 200 House of Judgement Rep and an Armour Core. At the end of each mode there is also the chance for Queen’s themed weapons to drop along with etheric light, exotics and other prizes too. There was also a look at some of the new Fallen themed weapons and armour that will be on offer. They look pretty sweet, I think you’ll agree. You can read the full reveal article over on the Bungie website. 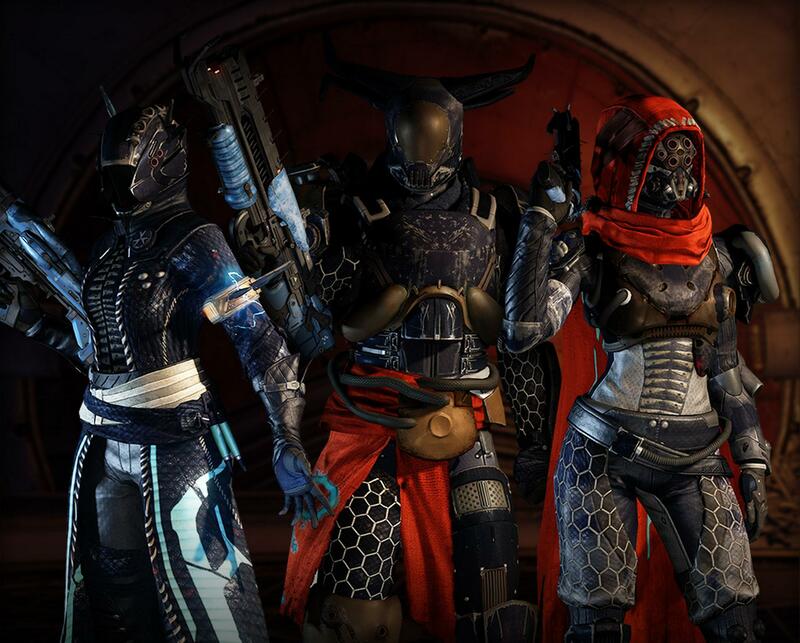 We also got to hear a little bit about the new Strike on offer for House of Wolves. The strike is called The Shadow Thief and takes place on the Moon. During the strike you will have to hunt down a Fallen mercenary named Taniks. Taniks resides in the House of Wolves Ketch ship. The strike will see you face off against Taniks numerous time throughout – similar to Omnigul, as you slowly wear him down. You will also have to deal with a Fallen Walker during the Strike mission – here’s hoping it’s a little more mobile than the Devil’s Liar walker. If you want to read some more or just keep up to date on the info head over to the Destiny Reddit, or see this thread for info. I think that just about covers everything. So, what do I make of it all? Granted I didn’t watch all of the stream from Bungie, mainly because I was doing other things, but also because they kind of sucked and kept dying, plus I felt like I’d seen quite a decent amount of it in terms of gameplay after 20 minutes or so. At first I was pretty excited about what I was seeing, but after a while it became clearly that really all this was, was you facing off against the same enemies in waves whilst you either stand by a certain spot waiting for something to happen. Or you just come up against another bullet sponge boss. Apart from the modifiers, it didn’t really look at that new. It just felt like the final moments of almost every mission where you just hold off enemies either until they stop spawning, or the objective that doesn’t really mean much has finished counting down. Sure it looked like it would be fun, but I can’t help but feel it lacked anything really new. I’m not going to judge it to harshly until I’ve played it myself because that wouldn’t be fair. Needless to say I will definitely be playing a lot of the new expansion to get a really good feel of it. What did you think of the reveal? Are you looking forward to playing House of Wolves?